We had such great success last year celebrating Christmas All Year Long! Won't you join us this year as we collect items for Operation Christmas Child Shoeboxes each and every month. 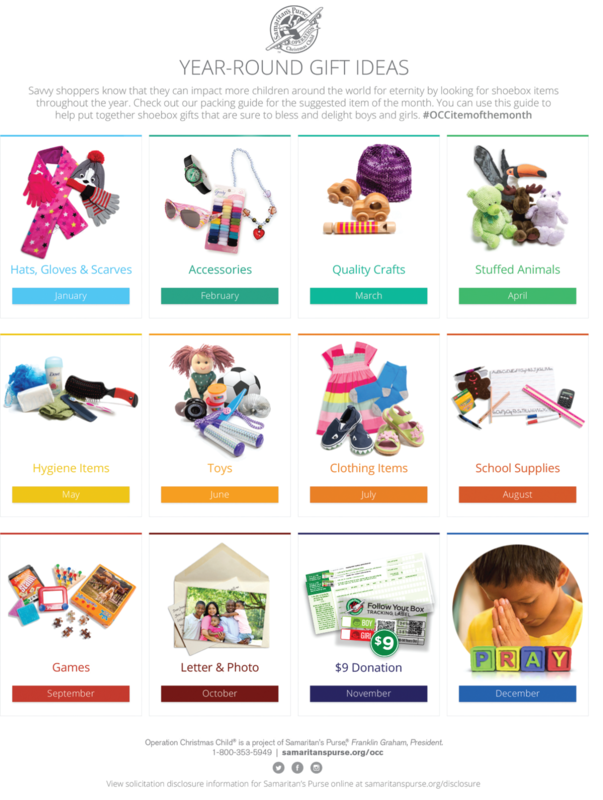 Check out the list above for items to provide. There is a collection box in the back of our worship center! On Sunday mornings we offer children's Life Groups by grade level in school, including Pre-K for 2 years and up. KidZone Church is for Kinder through 3rd Grade. It is our fun and interactive worship and Bible time for children. We meet during our worship time at 10:45 AM. Our nursery is staffed with quality, trained, caring Christian workers. Parents are encouraged to visit and volunteer in their child's room. Wednesday Nights Children's Discipleship at 6pm - 7:30pm in the MPR. This is for children Preschool through 5th Grade and is a hands-on, interactive program that your child will enjoy! Digging Into Discipleship brings a fresh approach to growing a lifelong relationship with God. As kids explore God’s character throughout the Bible, God transforms them from the inside out. Kids discover what it means to reflect the heart of God in everyday life. There are Bible stories and lessons, videos, music, and crafts! We believe that the spiritual education of each child is the parent’s responsibility. As such, we delight in partnering with parents for the short time that your children are with us. During that time, we strive to build disciples through developing a personal walk with Jesus, teaching children to witness to others and guiding children to worship Jesus from the heart. a. Every effort will be utilized to encourage children to grow spiritually, from believing in Jesus as his Savior to becoming spiritually mature befitting his age. c. Not only do children matter, but their parents and family as well. a. Every child will be able to hear the Gospel message each week in every setting. b. Each child will learn how to share the Gospel in the context of his age and understanding. a. The Bible is true in every respect and is our authority in all areas of life. b. Reading the Bible every day is encouraged. c. Learning to pray is worshipping God not just asking for stuff.